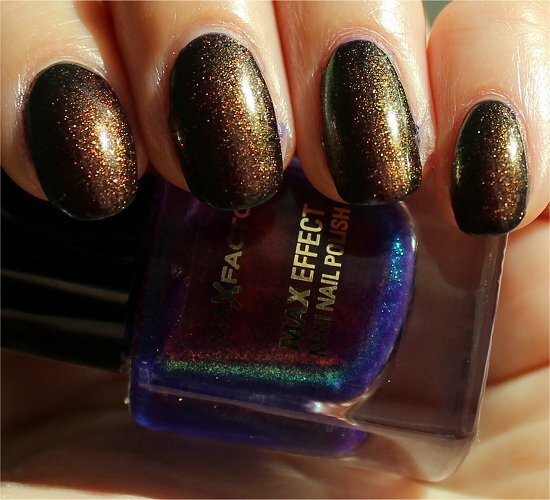 Max Factor Fantasy Fire is a multichromatic nail polish that’s very hard to get hold of because word has spread that it’s similar to the very-hard-to-find lacquer, Clarins 230 (aka Unicorn Pee). 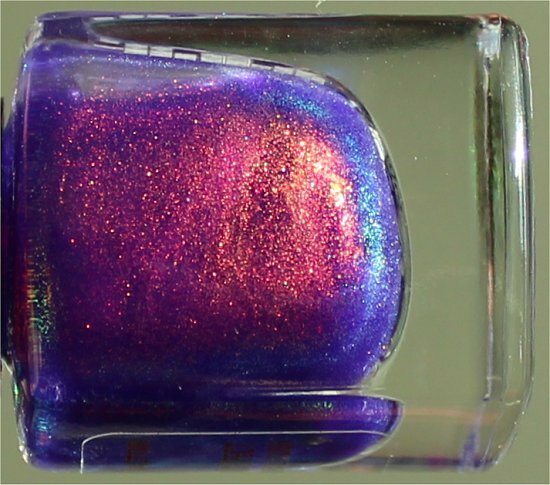 It’s a sheer, shimmery polish that’s a rainbow in a bottle. 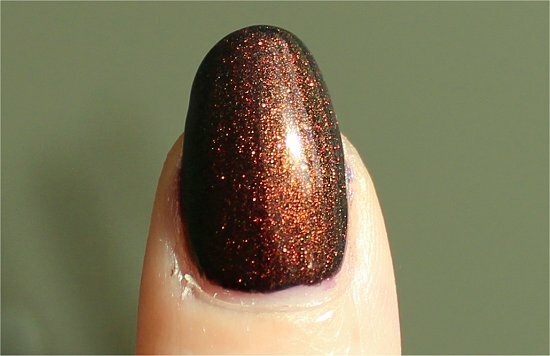 It’s meant to be layered over other polishes instead of worn solo. Well, I never thought that I’d ever see this in person. 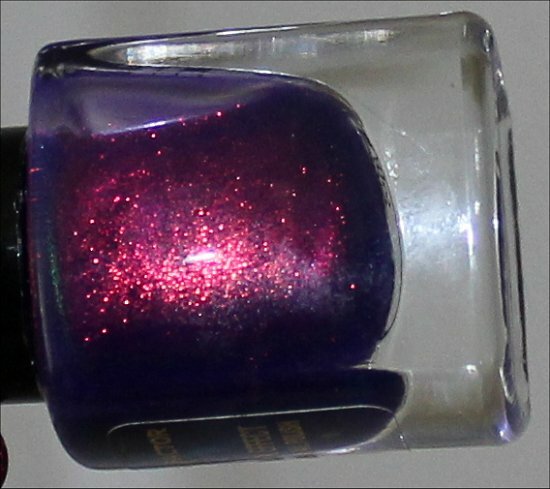 But a very generous and thoughtful Swatch And Learn reader offered to send me her bottle. When you look at the bottle, you’ll see a rainbow – red, orange, yellow, green, blue, and purple. The center is mainly red and orange, and then at the edges, you see the other colours. 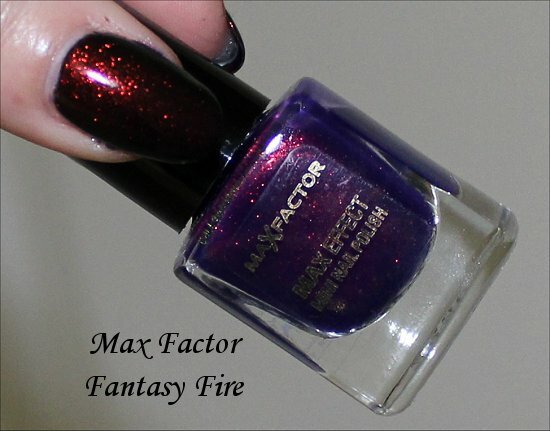 On the nail, Fantasy Fire by Max Factor has multiple personalities! 🙂 In sunlight or flash straight on, you’ll see the ‘fire’ because of the red, orange, and bronze that comes through loud and proud. 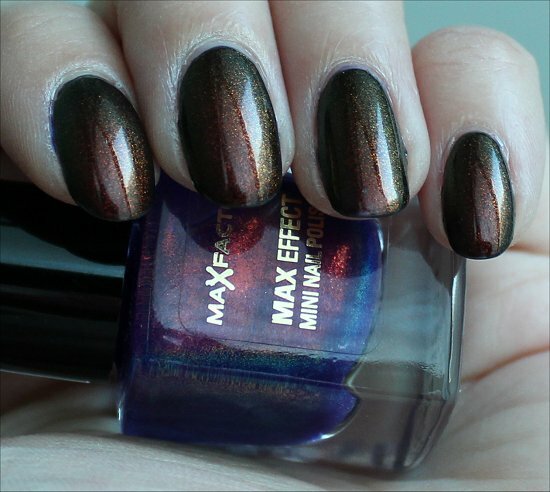 Tilt your nails a bit, and the orange and bronze dominate. 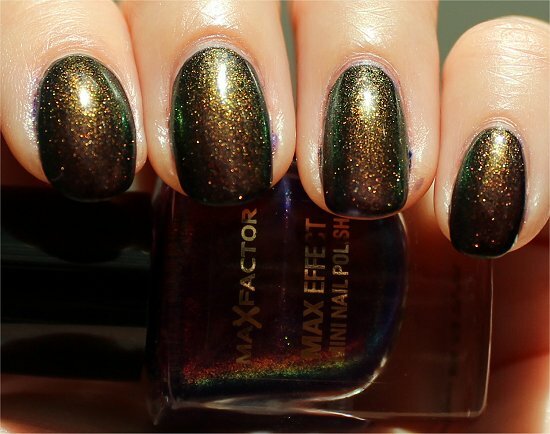 Tilt them more, and that’s when you’ll see it go from a swampy green to a full-on forest green! 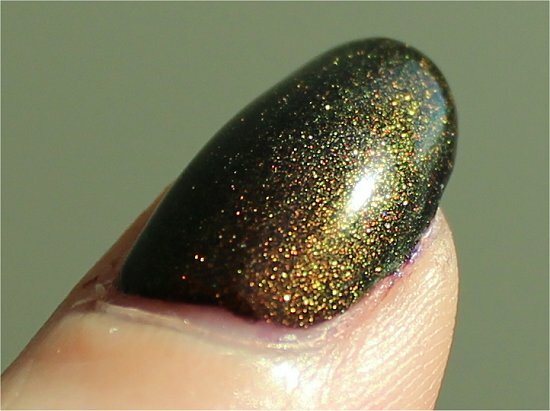 Mind you, this is what I saw when I layered the polish over China Glaze Liquid Leather, a black jelly polish. 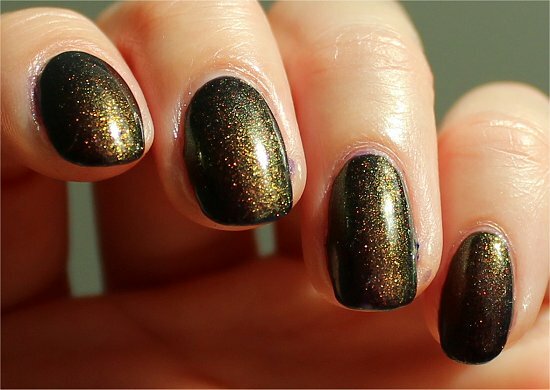 I chose to layer it over black because I’ve seen lots of swatches of this over purple, and I was curious to see it over black instead. 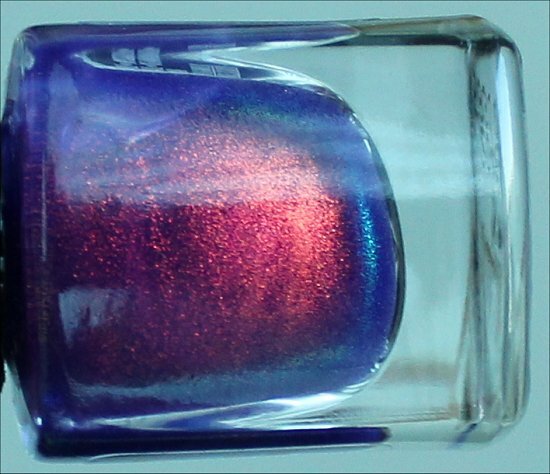 If you layer over a purple that’s similar to the base of Fantasy Fire, you may be able to see blue. 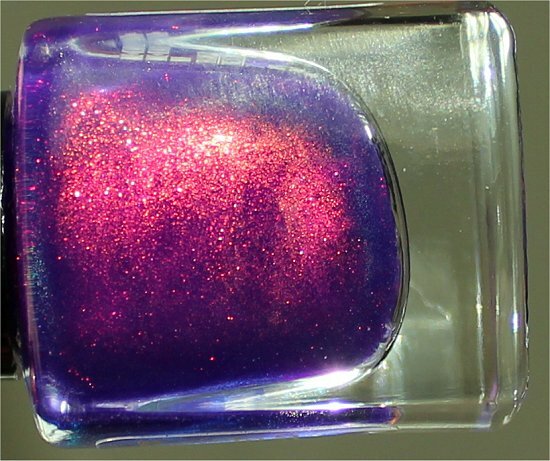 This is a very shimmery multichromatic nail polish. 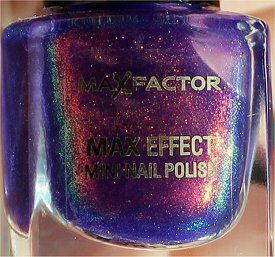 The shimmer is fierce – it’s the kind that twinkles and dances on your nails like pixie dust…or like how snow in the sunlight sparkles as I like to say. 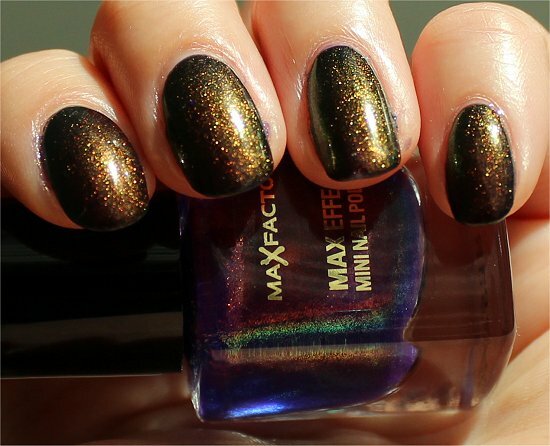 The formula is thin, watery, and sheer, but it’s very easy to control, and it applies extremely smoothly. 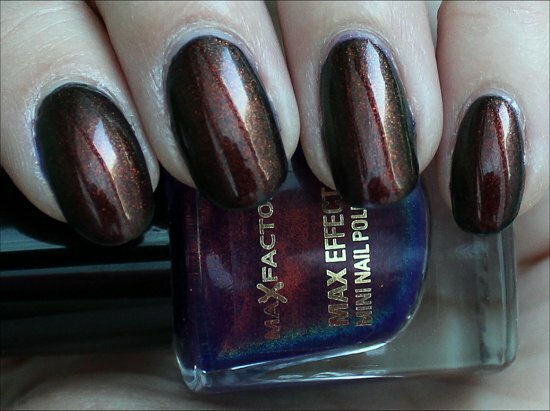 Since Fantasy Fire by Max Factor is so sheer, it’s meant to be layered over another polish to achieve the best results. 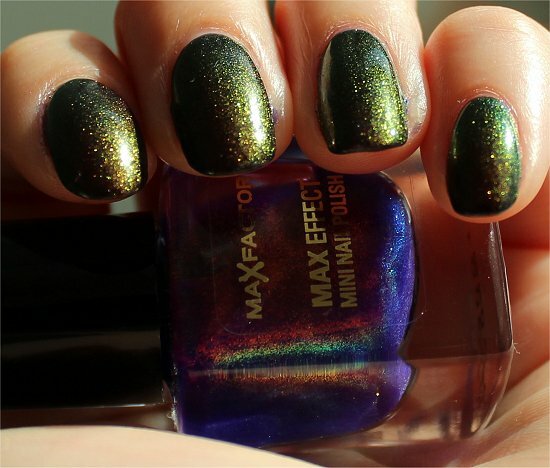 Also, I wouldn’t waste it by using it solo for a manicure because you’d need 2-4 coats to achieve full opacity, and this bottle is extremely small, so I feel like it would be a waste. 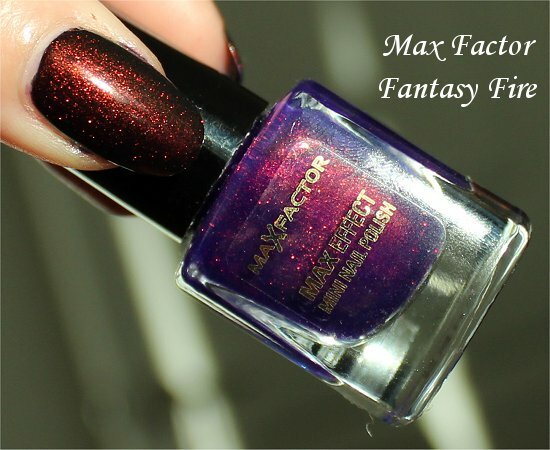 Is Max Factor Fantasy Fire a Dupe of Clarins 230 (aka Unicorn Pee)? Even though I now own both, I can’t say for certain because it’s been quite some time since I last wore Clarins 230. 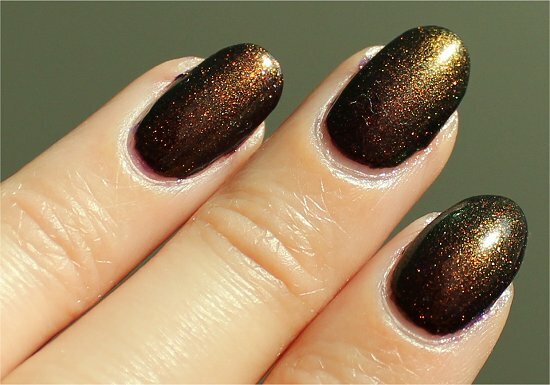 They do look similar to each other because they both have that intense shimmery finish and multichromatic nature. 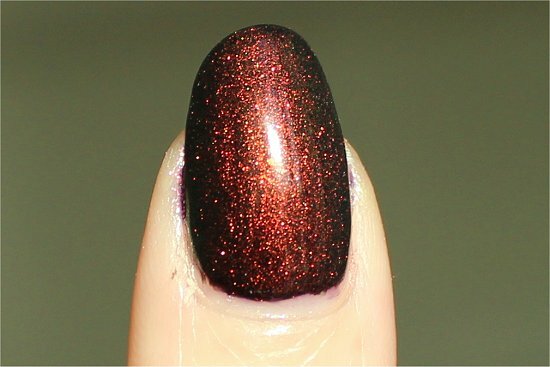 But I think that Fantasy Fire looks more purple and Clarins 230 looks more red. 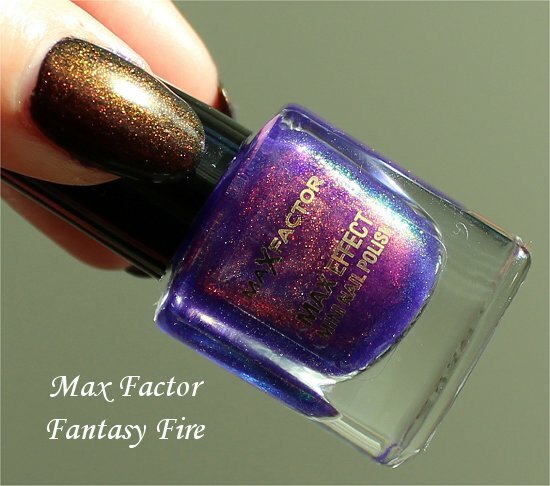 What Does Max Factor Fantasy Fire Look Solo? Here’s what it looks like on its own. 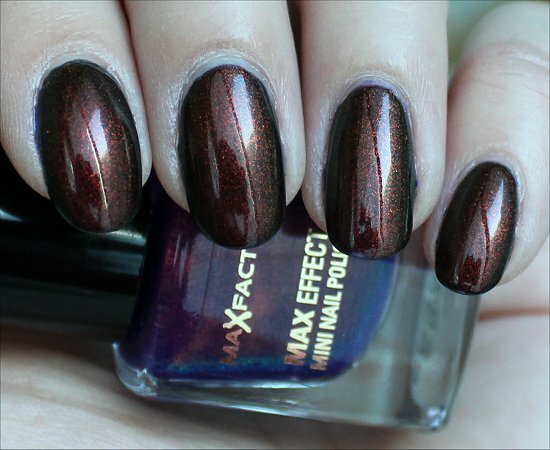 I painted 2 coats over a white nail-wheel tip. It’s too late for me. I’ve already been bitten. You still have time to save yourself! Hahahahahah! 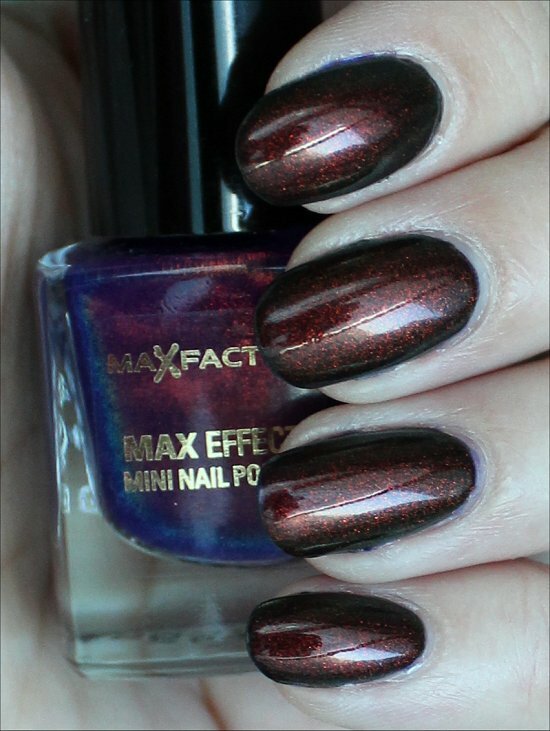 This entry was posted in Nail Polish Swatches & Reviews, Product Reviews and tagged Max Factor on June 16, 2012 by Mary S..
Oh my that polish is nothing short of amazing! I love it and want it! Beautiful photos-I think you caught every possible angle! Well done! Meredith recently posted: Born to Style! It is, isn’t it? If only they came out with a regular full-size bottle of it and made it easily accessible everywhere. Then I’m sure we’d all be stocking up, and then perhaps the price for Clarins 230 would go down. 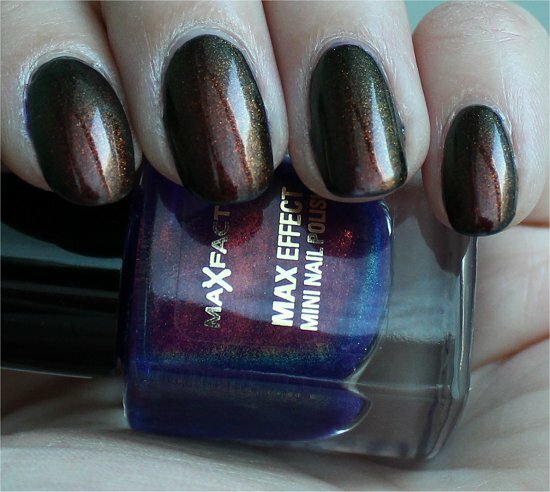 More people would be able to enjoy a quality multichrome that’s affordable! Wow, thats a lot of fingers! Haha 🙂 Isn’t FF insaaaaaane?! I don’t have Clarins, and I have accepted the fact that I never will so I was dying to get my hands on FF. I even bid on it a bunch on Ebay at one point but backed away when it was going past $30. No freaking way for a super tiny bottle of anything. 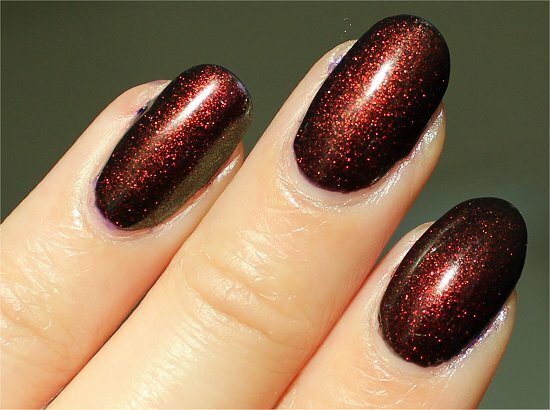 Luckily I also had a generous act of kindness bestowed upon me as well and Viktoria from ShePaintsHerNails.com sent me FF along with a few other polishes I wanted that she could get in the UK. I am forever in debt to her 🙂 It made my life lol. Yes, it’s so insane. I was skeptical about it having the beauty that Clarins 230 does, but…it actually didn’t disappoint or even pale in comparison. That’s a tough yard stick to measure up to, but Fantasy Fire really is appropriately named! 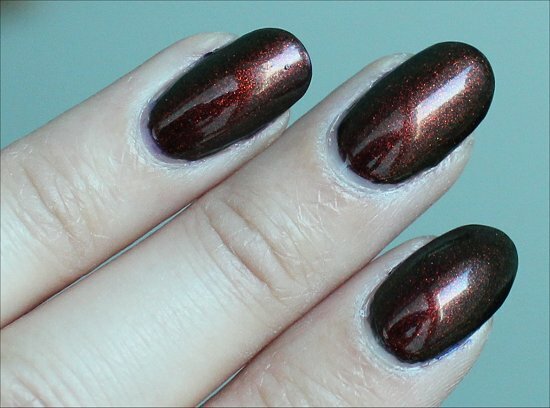 This is the kind of polish that if I can find and buy a back-up, I’d get one for a giveaway because my readers NEEEEED this polish, especially if they’ve never tried any duochromes/multichromes. Hey, if Fantasy Fire becomes more accessible, perhaps Clarins 230 prices will drop significantly and you can get it then. Or…maybe you can wait for the price to drop naturally. When I got mine, it was closer to $50. But I’ve seen it for way more than that. Sometimes there’ll be a listing for a $50 one, but you have to be fast on the draw. With the popularity of it increasing, though, I’m afraid that eBay sellers know the value and are jacking up the price. Oh, I wish Clarins re-released it. 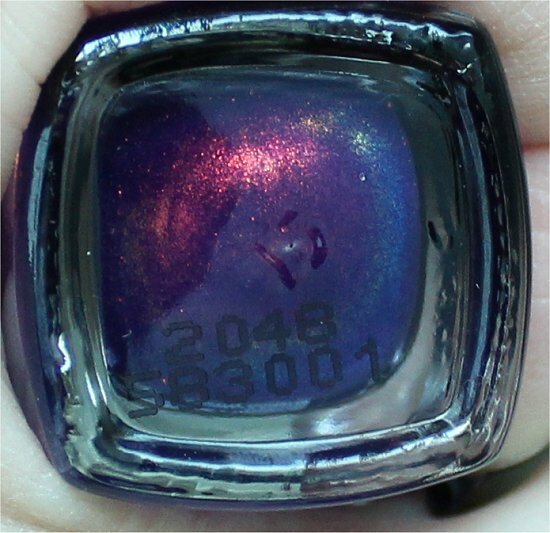 The pigment can’t be extinct like they said because Fantasy Fire has such a similar look. Wow, yeah, I don’t blame you. Paying more than $30 for a 4.5 mL bottle is craziness…especially when you could get a 15 mL bottle of Clarins 230 for $50-ish sometimes. How nice of Viktoria to have sent you a bottle! 🙂 Love and polish make the world go round…hehehhehe! 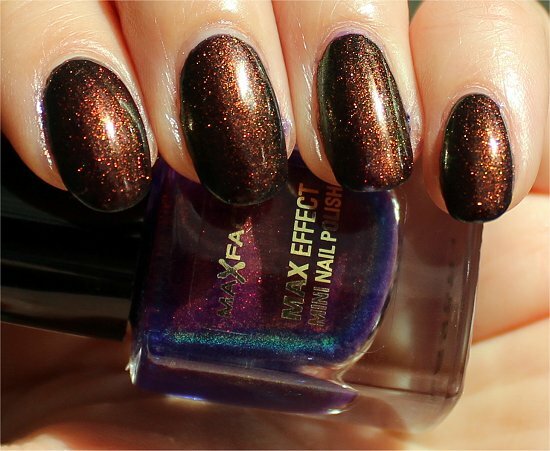 Yes, layered over a blue or purple would help to give you the bottle colour more. 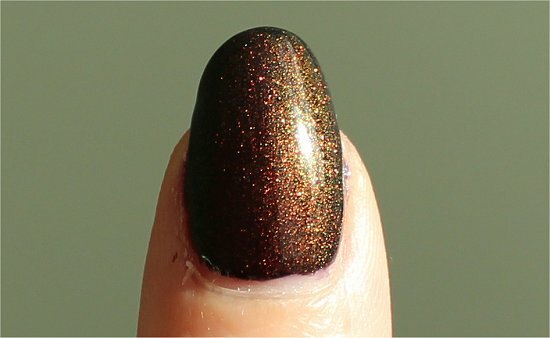 Fantasy Fire looks great over black! I only ever wear it over blues or purples – it takes on a completely different personality over a darker colour. I’ll have to try this combination myself. Yes, do try it. Also, I’m curious to see what this will look like over a green! WOW, you found FOUR? Amazing! And good call on snatching them all up. It’s definitely back-up worthy. Just took a look. Wow, I’m amazed at how close you were able to franken Clarins 230! 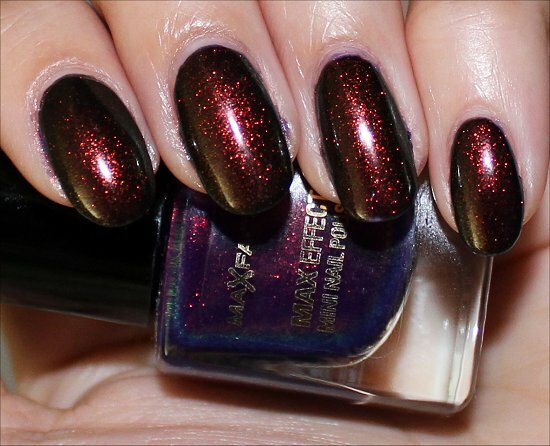 Another good option for a Clarins 230 substitute is a recipe and franken available on the More Nail Polish blog. She even has the original to compare it to. 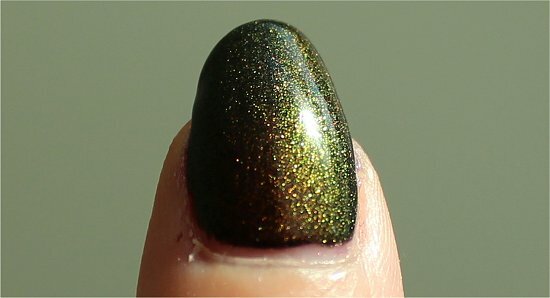 You can search her blog and the April 26th post features a comparison of the 2 with Fantasy Fire. Oohhhh! Thanks Another Cristina! 😀 I’m going to check that out! I am holding off on getting my own bottle of FF. Although it’s definitely more affordable than Clarins, it’s still a bit pricey for us Americans. 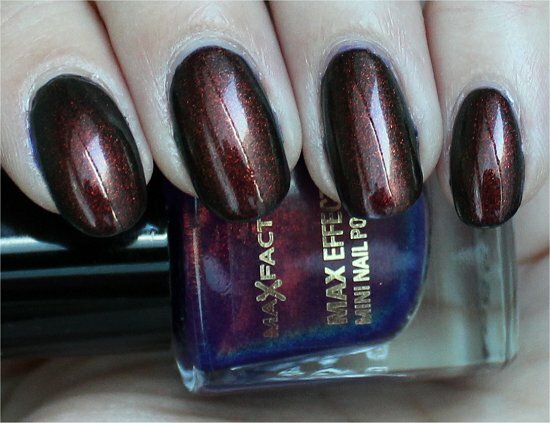 Also, I was lucky enough to have met fellow polish nut Sophie(http://nailsnotrocketscience.blogspot.com/) through your blog, and I’m holding out hope that Fantasy Fire will show up in Gernany eventually and that we can exchange. PS- I am such an malevolent influence *insert evil laugh*. 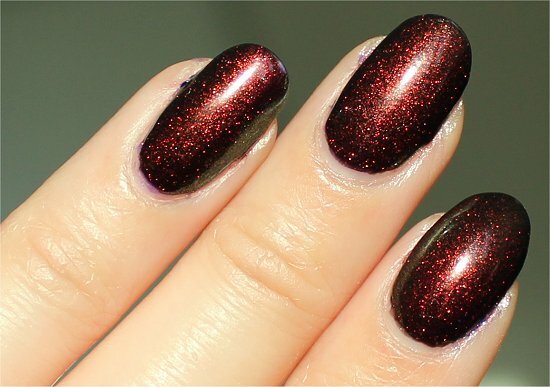 I was out shopping for polish with a friend who only recently got into nail polish when she showed me a shimmery polish and said it reminded her of “that unicorn stuff!” I think I can safely say I’ve turned her to the “dark side,” LOL! 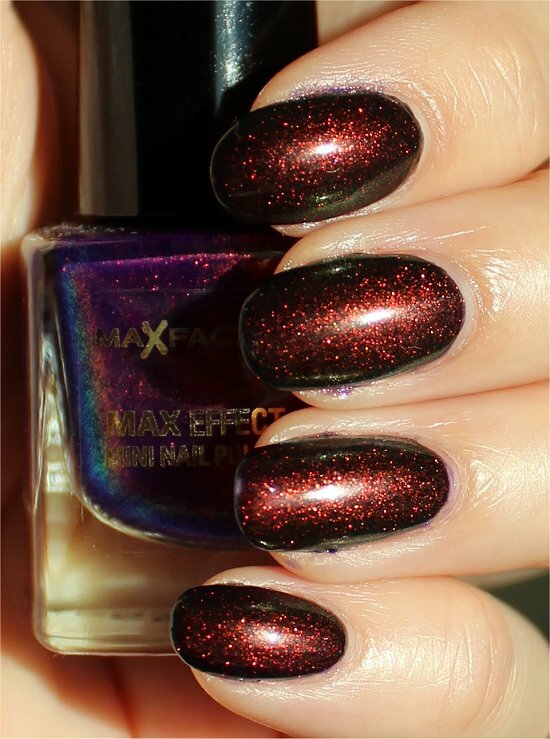 Another Cristina recently posted: China Glaze had Exotic Encounters Last Friday Night! YAY – I’m always so pleased to hear readers reaching out to other readers. 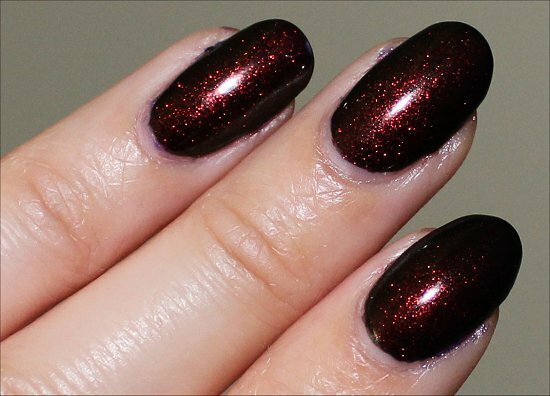 🙂 One of my goals for this blog was to turn it into a community of sorts so that people could feel free to make nail friends in a safe environment. 😀 So you just made me SO HAPPY! Thank you! 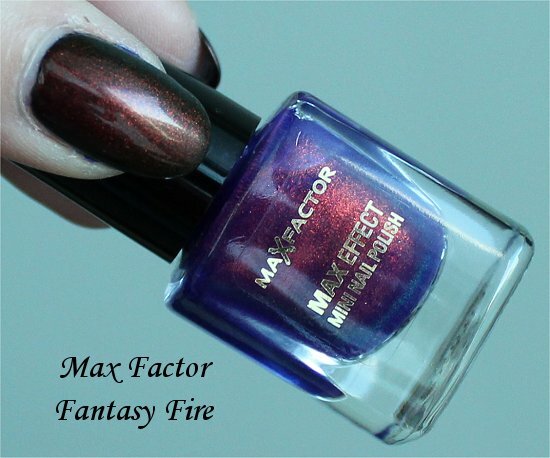 Fantasy Fire was born and made to live in your collection! 😉 It looks lovely on you!!!! 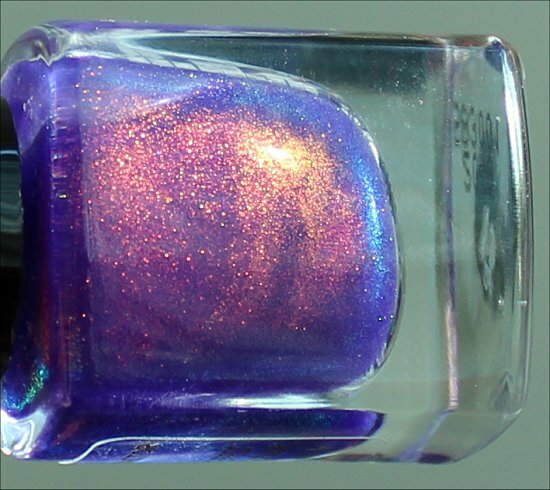 Sometimes when I look at the Fantasy Fire bottle, the lyrics “Come on, baby, light my fire!” come to mind. 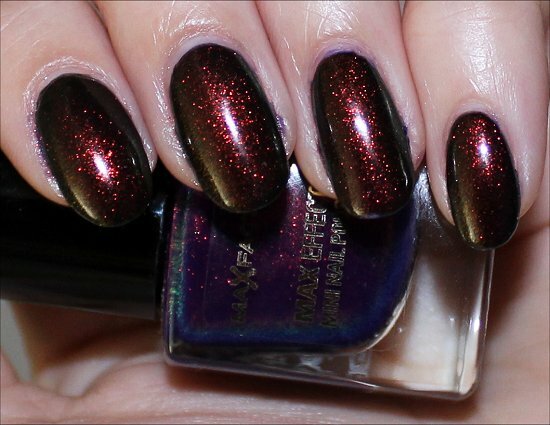 😉 This is certainly a polish that gets me going…haha! I’m glad that it also made it into your stash. 😀 You are the type of person who’d give it a good home! 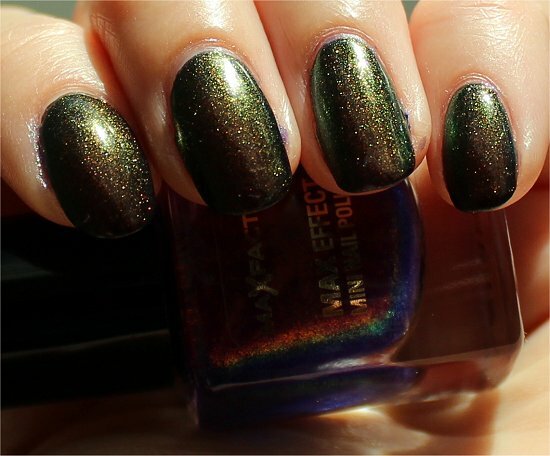 That comment about the swatches, coming from you especially, really made my heart soar! 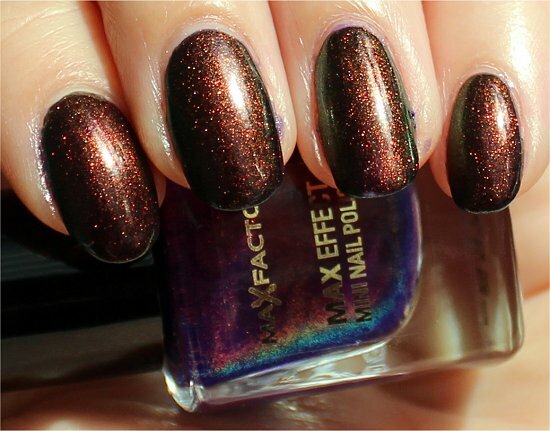 Love love this polish! Mine came today and it really is a tiny bottle. I think I’m going to splurge and swatch it on a wheel over wine, navy, purple, hot pink just to see how it shows, now that I’ve seen your black. 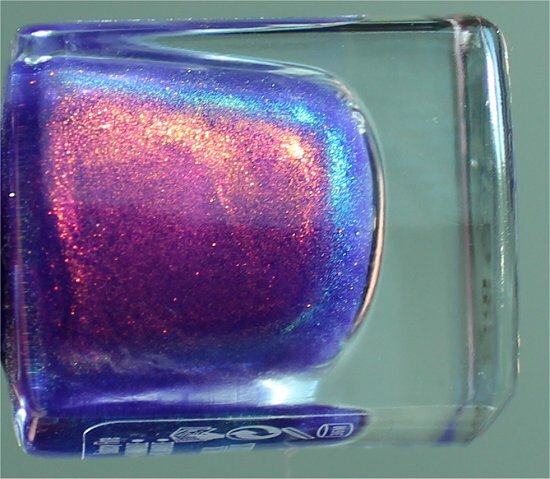 I’ll post a picture on Twitter after I finish gazing and playing and actually get it on my nails, lol. Oh my! 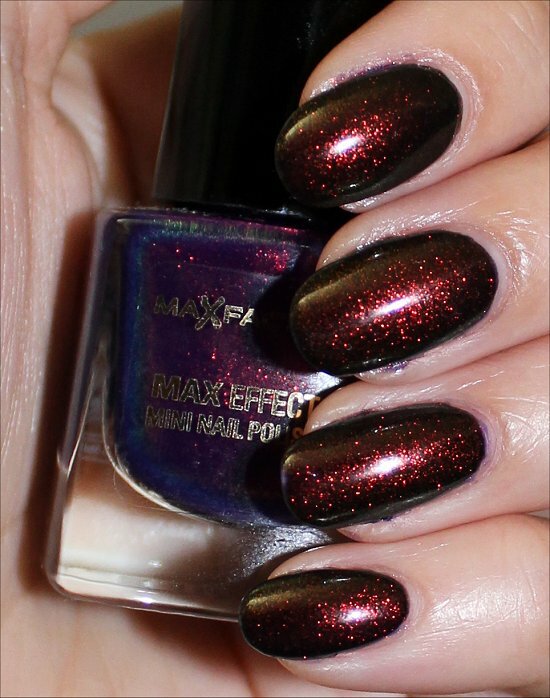 Okay, you MUST show me your swatches over those colours, okay? I’m curious to see how it’ll transform them! 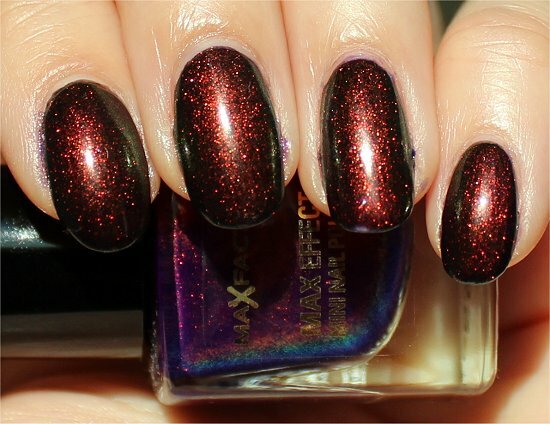 Such an amazing polish!! Love how you layered it. MariJo recently posted: Pink Wednesday, The Vegas Edition! 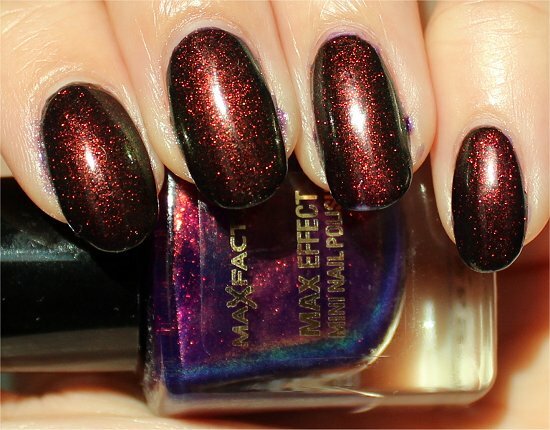 Haha, this polish is multiple-bottle back-up worthy! If I ever find it for a good price, I’ll stock up and then offer a few for a giveaway. I read a blog about 5-6 months ago, feat. 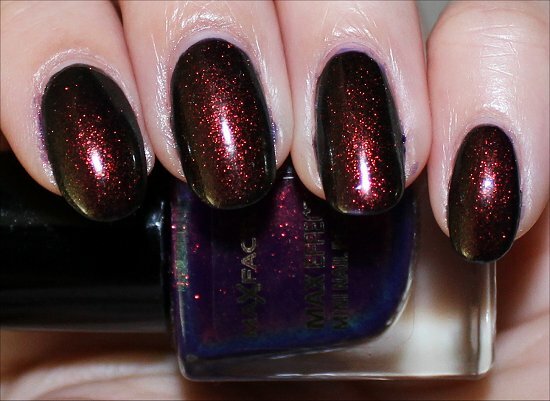 MF “Fantasy Fire” & C “230” and decided then & there, that finding a bottle of either colour, was my new life’s mission!! 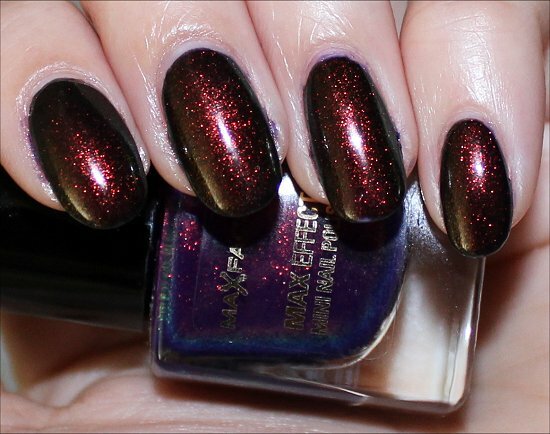 I searched EVERY shop I knew stocked nail polish & even some random shops, just in case. I put it’s existance down to the fact that some awesome things just don’t get to Australia. It was hard, but I got over it. The other day, I was scouting for cheap NP finds in my local TARGET and I (WARNING) needed to pee :-/ so I quickly did a once over of all the brands along the wall and STOP!! 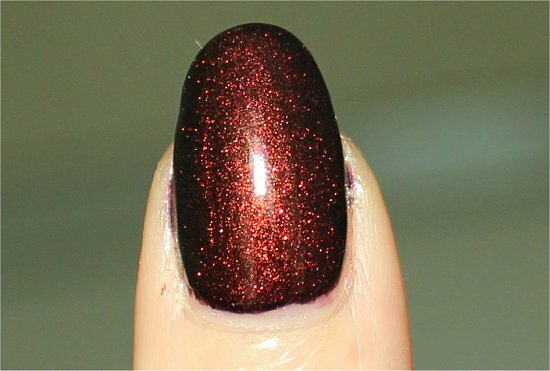 “Fantasy Fire” sparkling it’s way into my once broken heart!! 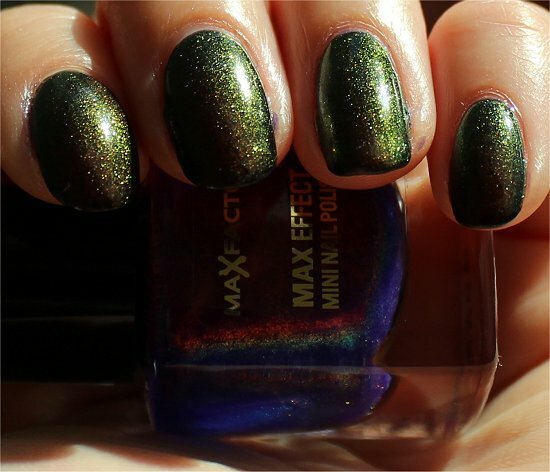 Eff the 12mL+ colours I’d found on sale!! I only had $10 on me, so I had to be frugal! 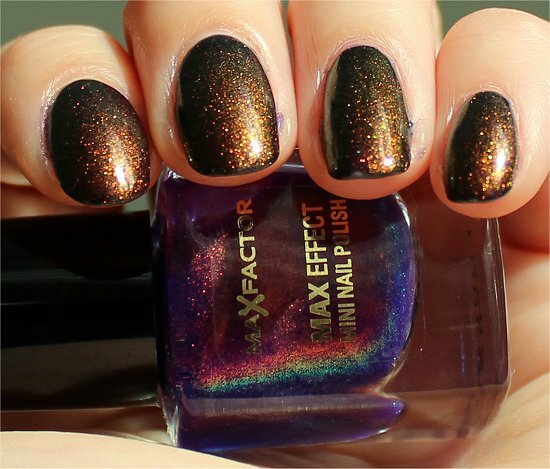 For Max Factor, that’s pretty cheap! 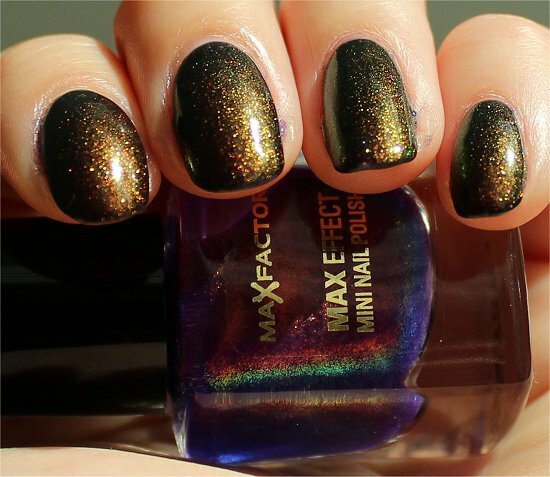 I had actually given myself a set of fluro green glitter acrylics & one nail was a dark silver glitter acrylic. 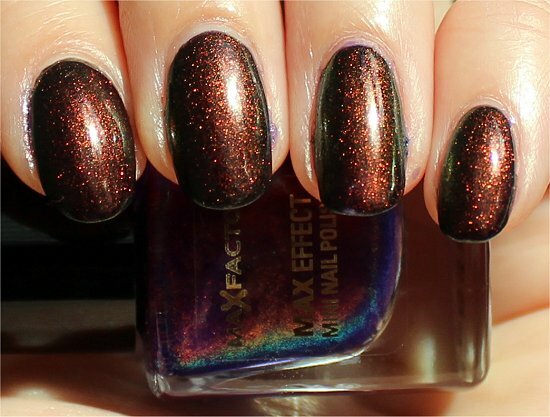 So when I got “Fantasy Fire” I couldn’t wait til I got home to remove the acrylics & paint my nails – so I opened the bottle in my car & painted the dark silver nail & OMFG?! IT LOOKED AMAZING!! 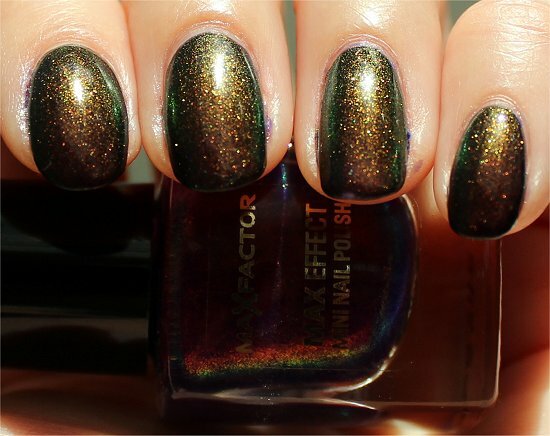 Then, knowing of it’s layering purpose, I painted a fluro green nail & HOLY CRAP, DID IT LOOK COMPLETELY DIFFERENT!! 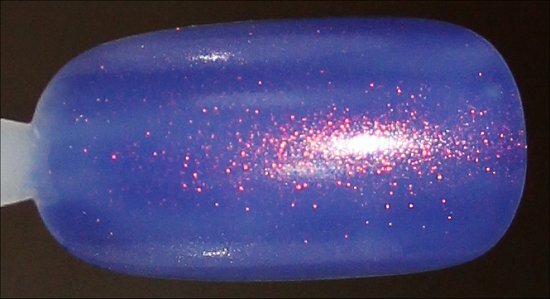 The green glitter had an aroura borelis effect in it, so on a different angle, there was a pretty cyan/aqua blue. 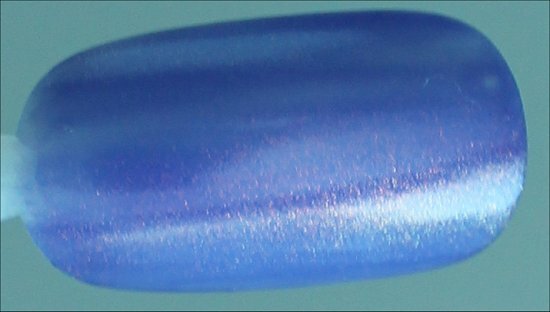 “Fantasy Fire” over this, picked up the blue & so the base colour was more like a jelly grey/blue, then the main shimmer was aqua blue & the sparkle was still quite red. SERIOUSLY, like nothing I’ve ever seen! I’m a Professional Nail Artist.